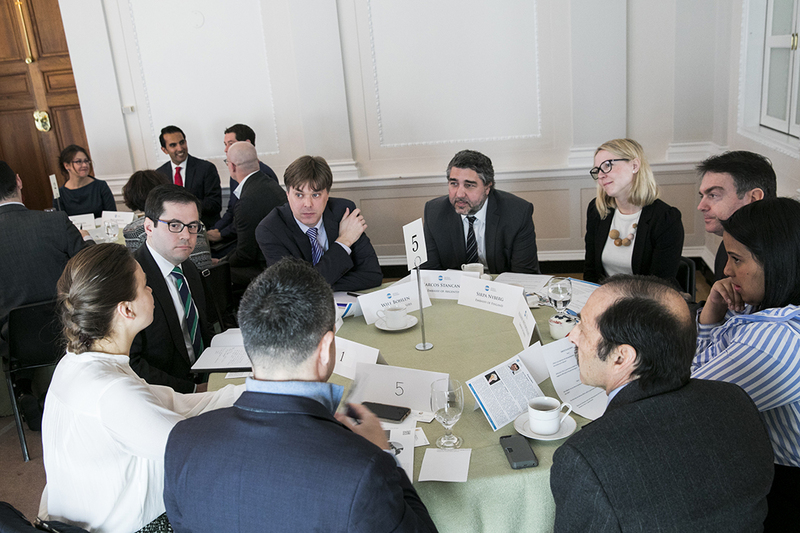 Ms. Mirna Vlašić Feketija (center) from the Embassy of Croatia speaks with Mr. Aykhan Hajizada (right) from the Embassy of the Republic of Azerbaijan and Nathan Daschle (left) from the Daschle Group at small table discussions. Photo by Kristoffer Tripplaar. How can you more effectively advocate for the issues that are important to your country? 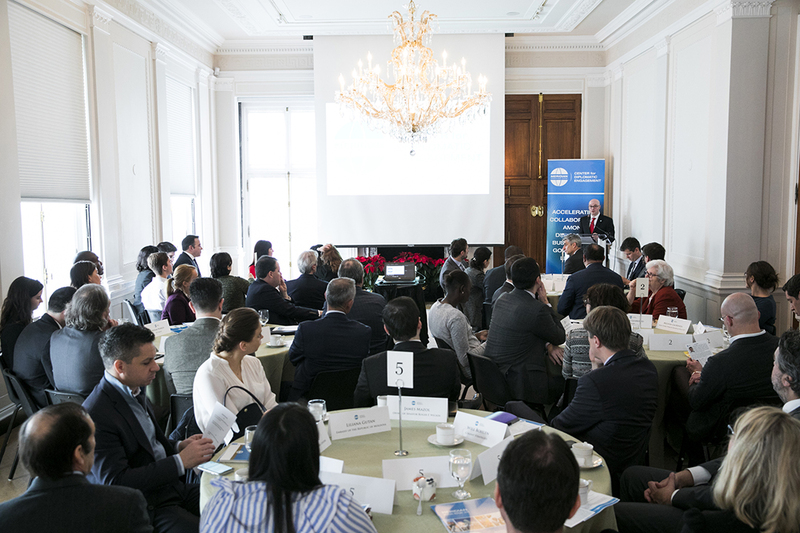 On November 30, 2018 the Meridian Center for Diplomatic Engagement hosted nearly 50 leaders in advocacy, the foreign diplomatic corps and U.S. government for a dialogue on advocacy in Washington. Influencing Washington: Issue Advocacy in the Nation’s Capital was the first in the Meridian Center for Diplomatic Engagement’s Diplocraft series, which uses peer networking and policy deep dives to help senior diplomats navigate the policy and political scenes in Washington. 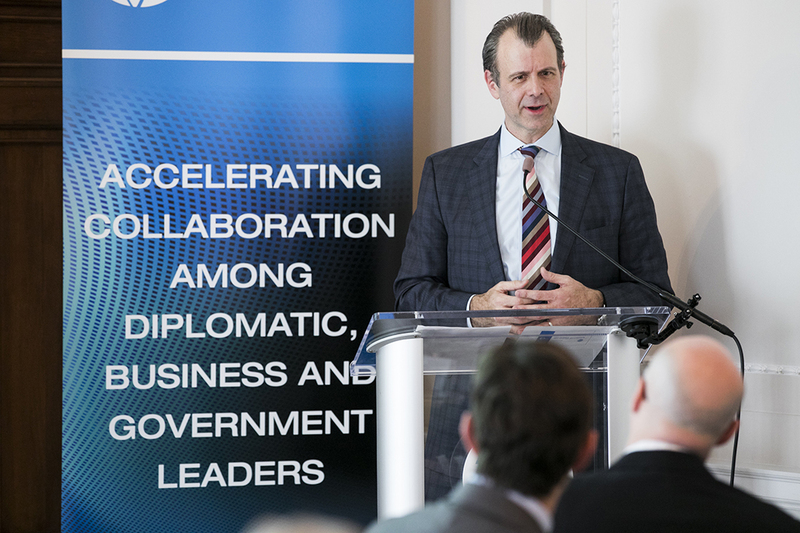 During this program, representatives from 19 different embassies listened to brief presentations from William Minor, Partner at DLA Piper, and Nancy LeaMond, Executive Vice President & Chief Advocacy and Engagement Officer at AARP. Minor’s presentation explored the scope, players and legal restrictions on lobbying in the United States. As an advisor in lobbying compliance, Minor spoke on the Lobbying Disclosure Act (LDA) and the Foreign Agents Registration Act (FARA) and how they impact organizations and lobbyists. LeaMond explained how to leverage the power of information and public opinion in advocacy. She emphasized the importance of utilizing your constituency and how organizations can frame the narrative of the issues they care about to be more effective in their efforts. Each presentation was followed by small group discussions in which attendees shared their personal experiences with advocacy in Washington. 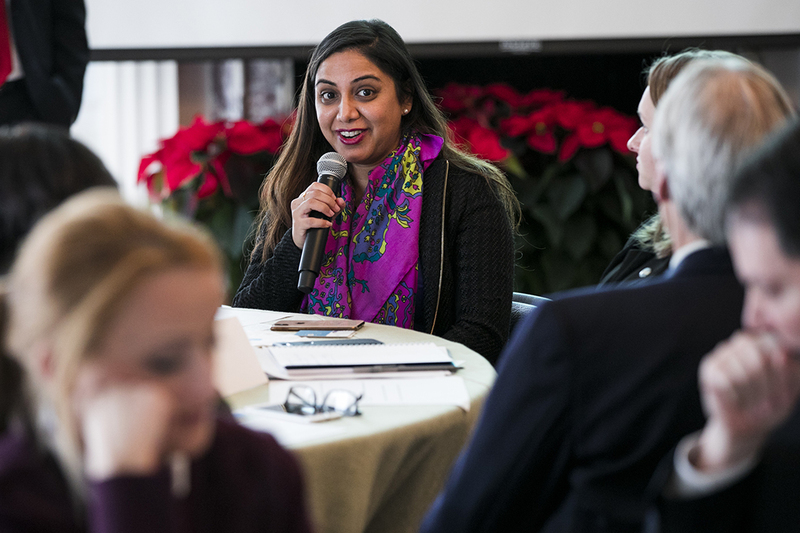 Participants noted that the U.S. system for policy making and the role of advocacy within that system can be very different from that of other countries and might take longer to fully grasp. The following were some important tips and takeaways made during these discussions and presentations. It is critical to understand current and proposed regulations to the practice of advocacy. Currently, most regulations address disclosure of information, but there is a growing number of regulations on the conduct of lobbyists that could impact your work. For example, members of Congress and staffers are usually unable to accept gifts above $10 unless the gifts are declared. Accredited diplomats registered with the State Department are not required to register under FARA or the LDA, but any efforts made by a U.S. lobbying or public affairs firms on behalf of an embassy must be disclosed. Effective advocacy requires working at all levels of the process. In the U.S., bureaucrats craft different policy approaches, political appointees recommend a specific approach, and the leadership select and enact the approach. To effectively advocate, you must first decide who is the most effective person to target—this may be someone from a local neighborhood commission to members of Congress and their staff. It is especially important to identify members with whom you have shared interests, either due to their committee work or their state’s background, and engage with these members at their local congressional offices as well as at their DC office. Once you have selected a target audience, it is critical to prepare a hard ask for your campaign—requesting tangible actions such as voting a specific way or rallying their constituents around a topic is necessary. Ensuring the ask is realistic may take research into the office or person’s stance on the topic at hand. Part of this also entails knowing the proper timing for advocacy efforts, such as knowing if legislation comes around on a regular schedule and not advocating too early or too late for action. Be cognizant that meetings with government officials may last no longer than 15 minutes, so it is important to go into meetings with a plan and clear, concise language. Leave collateral to underscore your verbal message. Keep in mind that a concise, well-worded one-pager is much more effective than a glossy brochure and less likely to be thrown away immediately. When possible, it is always best to use language that echoes that of the office to whom you are advocating to make it more accessible to those reading it. It is easier to convince leaders to act when you are speaking on behalf of a larger group of people—be it a coalition, public movement, or a group of constituents. For embassies this may include the diaspora community, dual citizens, and those with heritage from your nation who can help you leverage policy makers as affected constituents. Not only can you use these community members and similarly aligned NGOs or interest groups to bring a personal touch to enhance your argument, but also they can help you by magnifying your reach on social media and by amplifying your narrative. Having affected constituents pen editorials in local papers or engaging reporters from hometown press is effective, so that legislators are hearing from their constituents about the issues directly. 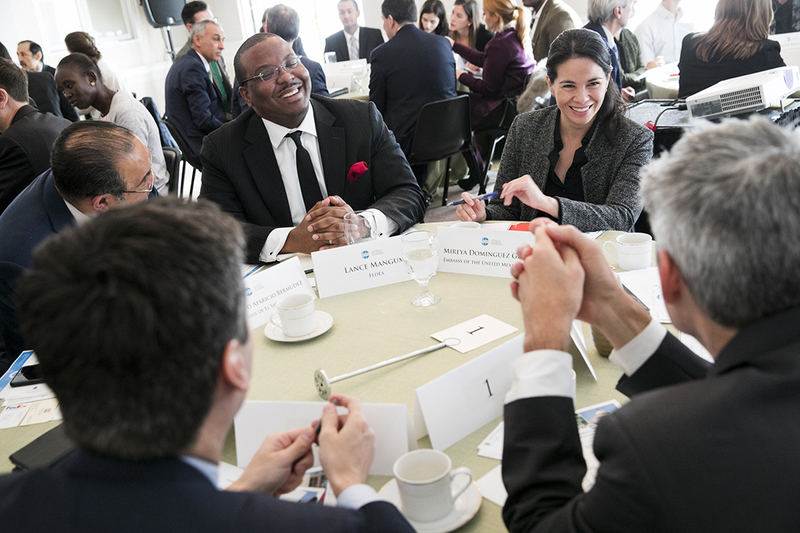 Lastly, it is critical to follow up on any ongoing issues and develop relationships with policymakers and staff to play the “long game.” These relationships allow you an entry point for other efforts in the future. Remember that in Washington that meaningful relationships are often not formed in the office—oftentimes it is the people you meet in a reception that end up becoming your most effective points of contact when trying to create movement on issues of importance. 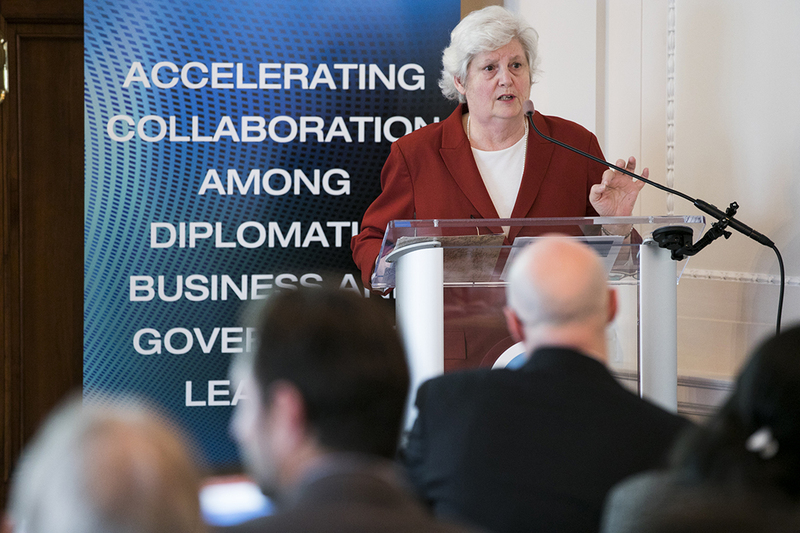 The Meridian Center for Diplomatic Engagement accelerates collaboration between the international diplomatic corps and the U.S. public and private sectors to address global challenges and opportunities facing the United States and the world today. 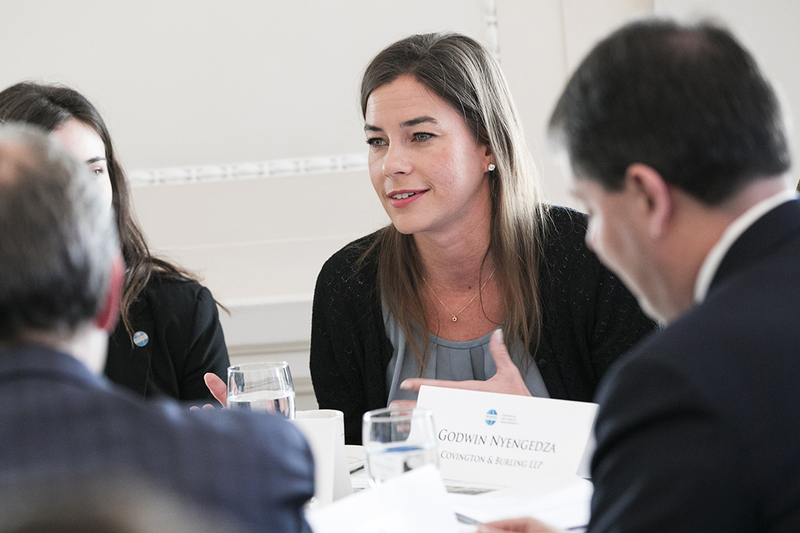 Meridian convenes programs across borders, parties and industries enabling participants to connect in intimate settings with top officials and policy-makers, dive deeply into issues, understand how Washington works and strengthen peer-to-peer relationships. Our ‘Diplocraft’ series provides senior diplomats with a greater understanding of the inner-workings of Washington through policy deep dives and peer networking opportunities. The series of convening programs provides context on key areas. Representatives from nearly 20 embassies, the business sector, and government listen to William Minor’s presentation in White-Meyer House. Photo by Kristoffer Tripplaar. William Minor, DLA Piper, speaks to attendees on the scope, players and legal restrictions on lobbying in the United States. Photo by Kristoffer Tripplaar. Attendees learn from one another’s experiences during sub-group discussions after William Minor’s presentation. Photo by Kristoffer Tripplaar. Shared experiences bring laughter to group during sub-group discussions. Photo by Kristoffer Tripplaar. Ms. Miriam Warren, DCI Group, shares her knowledge about advocacy in Washington with group. Photo by Kristoffer Tripplaar. 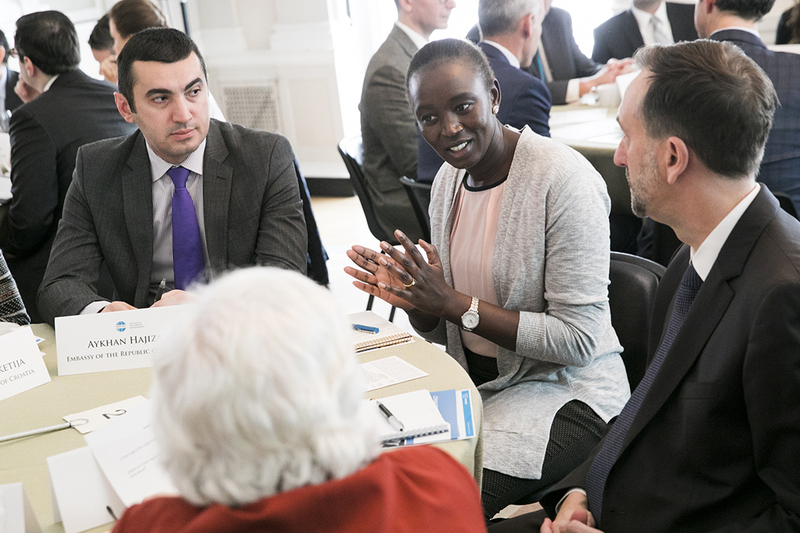 Ms. Angong Dhol Acuil, Embassy of the Republic of South Sudan, enhances discussion with group by sharing her advocacy experiences from both at home and within the United States. Photo by Kristoffer Tripplaar. Nancy LeaMond, AARP, presents on best practices for leveraging the power of information and public opinion in advocacy. Photo by Kristoffer Tripplaar. Ms. Rina Shah Bharara, Women’s Public Leadership Network, reports out to the larger group after a small table discussion. Photo by Kristoffer Tripplaar.